Antique English, Kings Pattern, Rare Pair Of Ice Cream Servers. A Complete Dinner Service For 12 People With A Selection Of 16 Serving Pieces, In The Rare Bacchanalian Pattern. A Beautifully Hand Forged Pattern With Heavily Cast Classical Figures & Ornamentation To Front & Rear Of Each Piece. A Regency Pattern Designed By Thomas Stothard, The Artist & Painter, Who Designed Numerous Unique Silver Patterns For Rundel, Bridge & Rundel, Most Pieces Were Made by Paul Storr And His Succesors, And Were Usually Only Produced For Dessert Services. Stag Hunt, Fox Hunt, Boar Hunt & Mask Were Other Similar Patterns Designed By Stothard For The Silversmiths. Most Of These Patterns Were Made Exclusively For The Royal Collection. We Have Available For Sale A Custom, Hand Made, Hand Forged Set, Complete For 12 People In The Dinner Size. Made By CJ Vander & Commissioned By Langfords Silver Galleries In London In 1981 For A Wealthy American Client. Each piece with detailed scenes of the ancient Roman festival in honor of Bacchus. The motif shows Bacchus, the Roman God of wine, riding a lion, whilst Diana looks on, with another figure asleep at her feet. The back of the spoons are also beautifully decorated, with a figural masque over a draped curtain, and tilted amphora of wine. Bunches of grapes and vine leaves complete the decoration. Set consists of 12 of each of the following: Dinner Knife 9.5″, Dinner Fork 8.35″, Round Bowl Soup Spoon 7″, Salad/Dessert Fork 7.25″, Dessert Spoon 7.25″, Dessert/Cheese Knife 8.6″, Butter Knife 6.35″, Tea Spoon 5.8″, Coffee Spoon 4.6″. Serving pieces consist of: 2 Piece Salad Servers 9″, 2 Serving Spoons 8.85″, 1 Serving Fork 8.75″ & Spoon 8.6″, 2 Gravy Ladles 6.5″, 2 Master Butter/Pate Knives 6.5″, Cheese/Bar Knife 8.25″, 4 Salt/Pepper Spoons 4.125″, 1 Mustard Spoon 4.45″. This is an exceptional set, by an exceptional maker, in an exceptionally rare pattern, in excellent condition. Complete dinner service for 12 people. Total of 124 pieces. Set Of 12 Sterling Silver Hand Forged Knives In The Kings Pattern. These Extra Large Knives Are An EXACT Copy Of The Antique Knives Of The 19th Century, But Made With Stainless Blades, As Opposed To The Regular, Rust Prone, Regular Steel Blade, Pre 1910. The Length Of This Knife Is 10 5/8″ Long, And Each Knife Weighs In At About 4.20 troy oz. Gross Weight Each. I Am Giving You The Weight, So That You Can Get An Idea Of The Quality, I am Not Trying To Sell You Them By The Oz., As They Have The Stainless Blade Included In That Gross Weight. This Is The Best Quality Knife Available, And Will Compliment Any Good Antique English Sterling Silver Set…Other Patterns Available…Table/Dinner & Dessert/Cheese/Luncheon Knives ..Other Sizes & Qualities Also Available, But These Are THE BEST… We Can Supply Single Knives Or Entire Sets.. I Also Have A Large Inventory Of English & European Flatware Sets, And Individual/Odd Pieces To Help You Finish Off Your Set..Feel Free To Contact Us For ANY Of Your Silver Requests..
12 English, Sterling Silver, Pistol Handled Dinner / Table Knives. Sterling Silver Handle With Stainless Steel Blades, But In The True Georgian Style. The Beauty Of The Pistol Handle, Is That It Will Compliment Almost Any Silver Pattern. 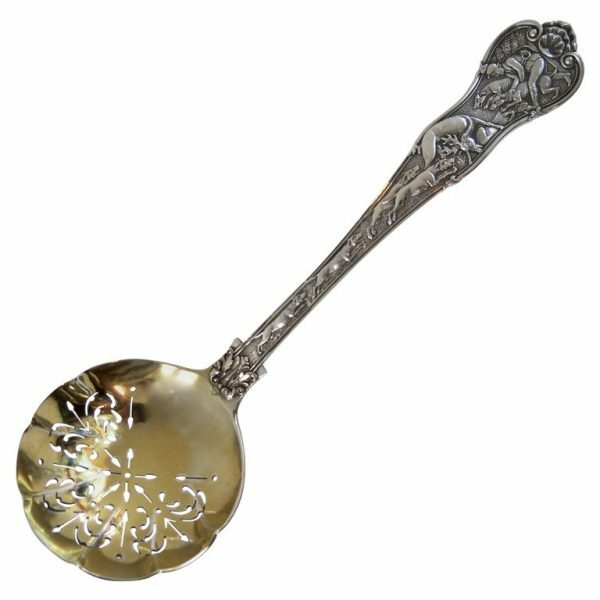 9 5/8″ Long We Also Have A Large Inventory Of Antique & 20th Century English Sterling Silver Flatware, In Almost All Patterns. Single Pieces And Entire Sets… Feel Free To Contact Us For More Information..
18 Royal Husk or Kings Husk Pattern English Sterling Silver Knives. 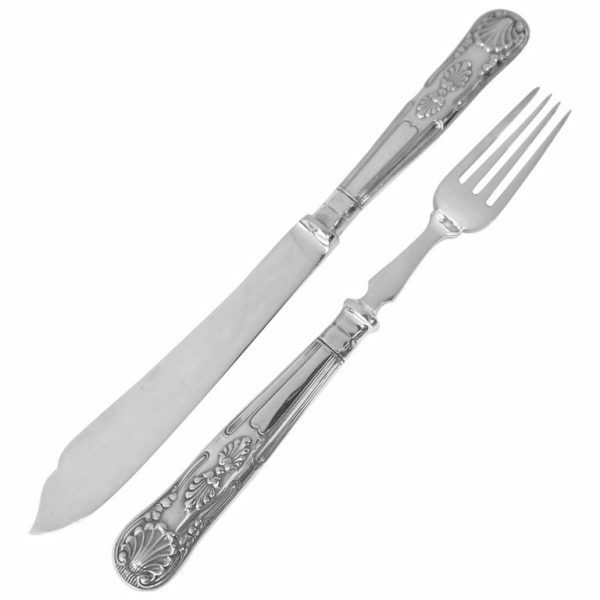 English Sterling Silver Handled Dinner Knives In The Royal Husk Pattern, Sometimes Referred To As The Kings Husk Pattern. 9.7″ Long. Blades Are Stainless. Price Is For 18 Knives. Contact Us For Price For 6, 12 Or More Makers Mark T.S. Hallmark For 2004. Very Good Used Condition. No Splits, No Monograms, No Damage. We Have A Huge Selection Of English Sterling Silver Knives In Stock, In All Patterns. We Also Have A Huge Selection Of English Flatware Pieces To Complete Your Antique Set. We Sell Single Pieces Or Entire Sets. Check Our Web page For A Small Selection, Or Feel Free To Visit Our Manhattan Gallery To See Our Entire Inventory. Set Of 12 Octagonal Pistol Table Knives. Made In England, With Sterling Silver Handles & Stainless Steel Blades. Also available In The Dessert/Salad/Cheese Size. Just One Of A Variety Of New Knives Available To match Almost Any Antique Flatware Set. We Sell Individual Place Pieces And Entire Sets. All Styles & Periods Available. Antique English Flatware Is Just One Of Our Many Specialties. We Have Over 20,000 Pieces Of Flatware Always In Stock. Some New Knives May Have To Be Made To Order, So Please Allow Extra Time For Delivery. A Set Of 12 Sterling Silver, Pistol Handled Table / Dinner Knives. Made By LA Crichton, London, 1930. The Handles Are Sterling Silver, The Blades Stainless Steel. Each Handle Is Fully & Correctly hallmarked. These Are Large Size Dinner Knives Measuring 9 7/8″ Long. The Handles Are Solid Silver And Are Not Filled Or Weighted. They Are Hard Soldered To The Blades And Will Not Separate. Large & Very Comprehensive Sterling Silver Flatware Set In An Early 18th Century Style. An Exceptional, English Sterling Silver Comprehensive Flatware Set, Complete In Original Fitted Oak Chest. Typical Of The Early Cutlery, The Forks Are All 3 Tyne, And The Knives Are All With The Shell Scroll Pistol Handles. Made By Sebastian Henry Garrard, Of Garrards The Crown Jewelers And Dated 1916, George IV. The Set Is Complete For 12 With Fish Eaters, Fruit Eaters As Well As Numerous Serving Items, Including Condiment Spoons, Asparagus Tongs & Carvers. The Complete List Is As Follows. All The Items Are Sterling Silver Hallmarked Unless Stated. 12 Table Spoons 12 Table Forks 12 Table Knives (Stainless Blades) 12 Salad Forks 12 Cheese Knives (Stainless Blades) 12 Dessert Spoons 12 Fruit Knives 12 Fruit Forks 12 Fish Knives 12 Fish Forks 12 Tea Spoons 11 Demitasse Spoons (This Is The Only Item Missing From The Entire Set) Serving Pieces Are As Follows: Large Soup or Punch Ladle Large Stuffing or Serving Spoon 1 Asparagus Tong 1Knife Sharpener (Steel Blade) 1Meat Carving Knife (Stainless Blade) 1Fowl Carving Knife (Stainless Blade) 1Meat Carving Fork (Stainless Tyne) 1Fowl carving Fork (Stainless Tyne) 1 Sugar Tongs, Grape Shears 4 Salt/Pepper Spoons 2 Mustard Spoons 1 Cream Ladle 1 Sugar Sifter 2 gravy Ladles 2 Pickle Forks 1 Master Butter Knife 2 Piece Fish Carvers 1 Crumber A Total Of 26 Serving Items. An Amazing Set, Great Early Style, Excellent Quality And A Premier Silversmith, All Fitted In An Oak Chest, Measuring 21 1/2″ x 14 1/8″ x 9″ High. No Monograms Or Initials. 1 Demitasse Spoon Is Missing, Otherwise A Very Complete Service. Sterling Silver, Queen Anne Pattern, Also Known As Rat Tail Pattern, Flatware Service. Complete For 12 People, Consisting of 12 Table Knives, 12 Table Forks, 12 Table Spoons, 12 Fish Forks, 12 Cheese Knives, 12 Dessert Forks, 12 Dessert Spoons, 12 Tea Spoons & 12 Compote Spoons. All Sterling Silver, Except The Knife Blades Which Are Stainless. The Stunning Set Is In Excellent Condition, And Each Piece Is Fully & Coirrectly Hallmarked, Circa 1940. Made by Mappin & Webb, a noted firm of Silversmiths and formerly cutlery manufacturers with roots back to 1774 when Joseph Mappin founded the firm. The company is now a retail jeweler, and Royal Warrant holder. Sterling Silver handled Dinner Knives By CJ Vander In The William & Mary Pattern, Sometimes Referred To As Charles II Pattern. 9.78″ Long. Blades Are Stainless. Price Per Knife Is $105.00 Call Or Email For Volume Discount & Discounted Shipping. We Have A Huge Selection Of CJ Vander Knives In Stock In All Patterns. We Also Have A Huge Selection Of English Flatware Pieces To Complete Your Antique Set. We Sell Single Pieces Or Entire Sets. Check Our Web page For A Small Selection, Or Feel Free To Visit Our Manhattan Gallery To See Our Entire Inventory. Beautiful Art Nouveau, Antique Victorian, English Cake Knife & Fork With Sterling Silver Handles & Blades. The Handle With Entwined Leaves & Berries, The Blades Hand Engraved With Trailing Leaves. Made By Savory Brothers, London 1888. Knife Is 11.5″ Long. Fork Is 9″ Long. Both Are Fully & Correctly Hallmarked. Fantastic Quality, English, 12 Sterling Silver Handled Knives With Shell Pattern. We Have Another Set Available If You Need 24. 10.75″ Long. Sterling Handle & Stainless Blades. To Give You An Idea Of Quality, These Knives Have A Total Gross Weight Of About 130 Grams Each. We have a HUGE selection of antique silver flatware. Matching service for 1 piece or entire sets. We also have a huge selection of replacement sterling silver knives in most antique English patterns, including pistol handle. All items are available for sale in our Manhattan gallery, or feel free to email us EstateSilver@yahoo.com for pictures & prices etc. Estate & Antique Silver is our ONLY business. A complete and very comprehensive, English sterling silver hallmarked flatware service for 12 people, made by Emile Viner, Circa 1940, in the deco, Sandringham pattern, his most famous design. Comprising: 12 dinner forks, 12 dinner knives, 12 dessert forks, 12 cheese knives, 12 fish forks, 12 fish knives, 12 hors d’oeuvres forks, 12 hors d’oeuvres knives, 12 dessert spoons, 12 soup spoons, 12 citrus spoons, 12 teaspoons, 12 coffee spoons, 6 serving spoons, 2 salt spoons, 1 mustard spoon, 1 soup ladle, 2 gravy ladles, a 2 piece fish serving set, a 6 piece fowl & meat carving set, 2 vegetable serving spoons, 1 pair of sugar tongs, 2 preserve spades, 1 pickle fork; All with with initial “R” and fitted into an original wood cutlery chest on stand. Just one item from our huge silver collection for sale at our Manhattan gallery, and from our web page www.EstateSilver.com. Comprehensive, English sterling silver hallmarked flatware service for 12 people. Just one item from our huge silver collection for sale at our Manhattan gallery, and from our web page www.EstateSilver.com.